I opened my eyes and saw a woman gently holding my right hand. She was speaking in soft tones to my dad who stood beside her, listening intently. My fingertips had been gangrenous for months and the flesh was slowly disintegrating. Open wounds were forming around my nail beds and my risk of infection was increasing dramatically. Realizing I had awoken, both the woman and Dad greeted me with smiles. The woman introduced herself as a surgeon and calmly explained how my fingertips would be amputated. Dad, always the optimist, jumped into the conversation and enthusiastically added, "But the good news is you'll get to keep one thumb!" I mumbled something in reply but I doubt it made sense. I was still learning to speak again after my brain haemorrhage and was incredibly groggy from all of the medication. Even though I didn't share Dad's enthusiasm at the time, I'm incredibly grateful for my remaining thumb today. I was in the hospital for over a year that first time. It was 2005, I was 24 years old and a nasty virus had caused my brain to haemorrhage. 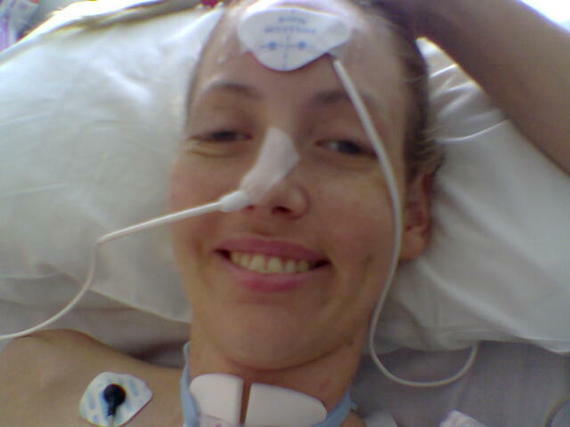 I was in a coma for three weeks and on life support for two months. All of my organs shut down and my family were told they would have to turn off my life support if things did not improve. While my health did improve, things also got worse for me. In the months that followed, all of my toes, one leg and nine fingertips were amputated. Since then I've also had heart surgery twice and a hip replacement, aged 27. I now have permanent brain damage, am over 25% blind, have epilepsy and use a wheelchair to get around. That first year in the hospital was tough. I don't remember all of it because I was either in a coma or under aesthetic on an operating table. However, I do remember being grateful. It sounds like a strange thing to say since there were some really bad things happening but I chose genuine gratitude to help me through. Where did my gratitude come from? Gratitude didn't just suddenly appear as an epiphany in the hospital. When I think back to my childhood, gratitude was a value that my parents instilled in my siblings and I. Our upbringing was fairly modest and middle-class. We didn't have lots of stuff (toys, clothes, games, etc.) 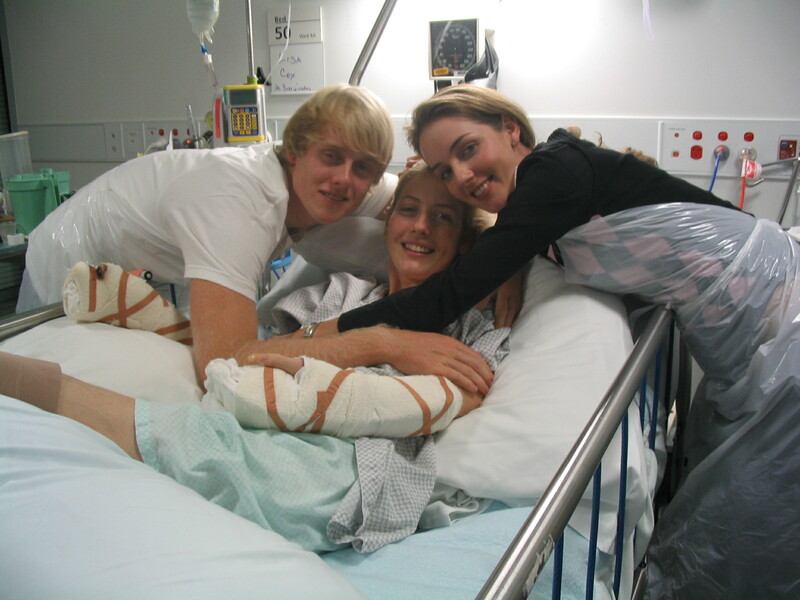 but Mum and Dad ensured my siblings and I understood how lucky we were for what we did have. Above: Several months into my first year, with my incredible siblings. When I was older I went travelling overseas and witnessed terrible poverty and hardship. Again I replicated the learnings of my childhood and was grateful for what I did have. As a full-time university student working part-time in hospitality, it wasn't a lot but it was more than enough. Lying in that hospital, I was simply grateful to be alive. Of course, I grieved and questioned, "why me?" But no amount of complaining was going to change the situation. Fortunately, the tears soon stopped and I realised that self-pity was more disabling than any of my other newly acquired disabilities. It can be easy to find gratitude when things are going well. But how do you stay grateful during the really bad times? This might not work for everyone but here are just a few of the ways I stayed grateful at really bad times. I'd be a terrible comedian but using humor and comedy kept my spirits up when I was feeling down. Obviously, there are bad situations when I wouldn't even consider using humor but there were times when it did help. By lightening the mood I was able to keep the situation in perspective and be grateful for the smaller things in my day. When I found out my leg was going to be amputated, I was a mess. If I wasn't crying hysterically, I was sitting silently in stunned disbelief. After a little while, I pulled myself together and realized that worse things could happen. Importantly, this was a situation well outside of my control so I kinda had to go with the flow and get on with life. My limb would come off but my life would go on. Wallowing in self-pity achieved nothing so instead I brainstormed the advantages of only having one leg. These included: A 50% discount on leg waxing and half-price reflexology. Yipeee!!! I thought it was hilarious even others probably thought I was nuts! Like I said, I'm not a comedian but at the time, a little humour helped me a lot and still does today. During one of my return visits for more surgery I was placed in the infection control ward and had very limited contact with the outside world. I spent my 25th and 26th birthdays in the hospital and while there were places I would have rather been, I knew it was the best place for me at the time. On this occasion, I was only there for a couple of weeks but it was during that time that the Beaconsfield Mine disaster was unfolding. If you don't remember, two Australian miners were trapped underground for 14 days following a mine shaft collapse. I was grateful for the tiny television in my room and watched each day as media updates came from the site. Reports of the men's 'living' conditions filtered through and included a "coffin-sized space" in which to move. Comparatively, my small public hospital room was like a 5-star resort! Well, not really but I did have meals delivered, air conditioning, a little sunshine and visits from staff, family and friends, even if they had to wear gloves and plastic aprons to come near me. Remember earlier when I mentioned my dad enthusiastically telling me I would keep one thumb, even though the other nine would be amputated? This was something that I kept doing throughout my recovery and still do today. Keeping one thumb was a really small win but it was something. The first time I fed myself was such an exciting day. I'd been fed through a nasal gastric feed tube for months and after that staff and family would feed me with a spoon. I was incredibly grateful for that tiny bit of independence that I had reclaimed. This pattern continued and I found enormous gratitude in the little achievements that I made each day. Gratitude was and still is a choice for me, even with my anxiety. Gratitude is a choice for us all. It became an unconscious choice that I unknowingly practiced repeatedly growing up. However, I never expected my resilience to be tested like it was! It is possible to be grateful amidst the grief. How exactly you do that is a personal thing but just know that it is possible.